Possibly the region's first craft brewer, Thomas Jefferson grew hops and created his own small-batch brews at his home at Monticello. His brewing, however, was only the beginning. Charlie Papazian got his start homebrewing at the University of Virginia and went on to become a founder of the craft brewing movement. The city was not spared the fervent debate over prohibition, and the area went dry well in advance of the country in 1907. The Brew Ridge Trail set the standard for regional attractions focused on brewery destinations and sees thousands trek through the beautiful countryside enjoying libations. National award–winning breweries like Devils Backbone, Starr Hill and Three Notch'd elevated Charlottesville to a center of craft beer. 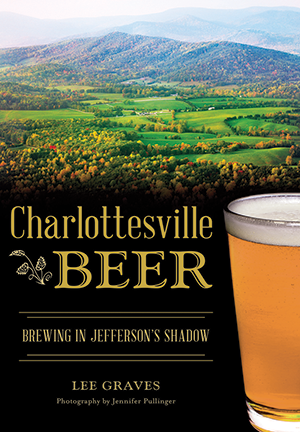 Author Lee Graves offers a history and guide to brewing in scenic Charlottesville. In 1996, while a writer and editor at the Richmond Times-Dispatch, Lee Graves began writing a weekly column about beer; it was syndicated by Tribune Media Services in Chicago for several years. In 2014, his Richmond Beer: A History of Brewing in the River City was published by The History Press. A lifelong resident of Virginia and a graduate of the College of William and Mary, he continues to write about beer for magazines and his website, www.leegraves.com. He also occasionally homebrews and frequently speaks to community and professional groups. Graves currently splits time between Charlottesville and Richmond, where he lives with his wife, Marggie.